In these pages we regularly mention the unique attributes of gold bullion investment, and how gold is able to diversify a portfolio like nothing else. We’ve cited a gold investment’s role in Harry Browne’s legendary Permanent Portfolio, the role gold has played in Jim Rogers’ stellar investment record, and why Swiss bankers and traditional money managers always steered clients to put >10% into gold bullion. Research just out from the World Gold Council (WGC), titled ‘Gold as a Strategic Asset for UK Investors’, adds to the evidence that gold investing adds diversification to a portfolio like nothing else. This research argues that gold is the ultimate diversifier, and more relevant to investors today than ever. For more detailed analysis, read the WGC’s full report. The WGC’s new research finds that across a wide range of investment strategies, from conservative, moderate, to aggressive, gold ‘is a significant contributor to portfolio efficiency by reducing risk-adjusted returns and reducing expected losses’. Essentially gold can help balance many types of portfolios, and crucially help protect against losses. 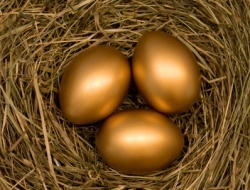 The WGC argue that holding between 2.6% and 9.5% own ones wealth in gold can help achieve this diversification. Within the wider research piece the WGC also find, as others have before, that over a 25 year sample period gold has strong ‘risk-hedging credentials’. To cut through the jargon again, this means that gold is indeed good at protecting your portfolio when bad things happen. Gold’s ability to reduce losses was tested… and during multiple periods of financial markets turmoil. During most market crises over the last 25 years, gold has consistently increased portfolio gains or reduced its losses. We found that in 78% of all the cases analysed, gold reduced the loss experienced during eight tail-risk events. For example, we found that during the 2008–2009 recession investors having a modest allocation to gold saw a reduction in losses… for various levels of risk tolerance… we found that all portfolios containing gold significantly reduced losses during the worst two periods linked to the European sovereign debt crisis. Investing in gold with part of your portfolio was found to benefit UK investors with different risk tolerances over a significant time period, and crucially during financial crises. All articles and information published by executives of The Real Asset Company are to inform and aid your thinking and investment decisions, not lead them. Information or data included here within may already be out of date or touch, and must be verified by you elsewhere, should you choose to act on it. YELLOW CAKE (LON:YCA), an "Alternative Investment"?